NYC’s major Michael Bloomberg says he wants to ban the drinks from restaurants, cinemas and street stalls. 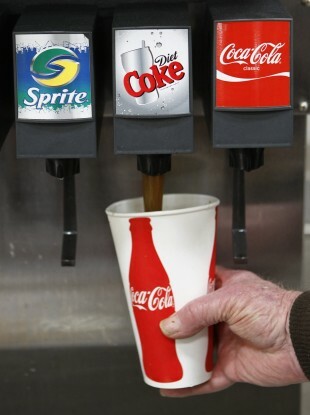 LARGE FIZZY DRINKS may become a thing of the past in New York City if the mayor gets his way. Michael Bloomberg, the city’s mayor, has unveiled a plan to ban the sale of large sugary drinks at restaurants, cinemas and from street stalls in NYC as part of an ongoing battle to combat rising obesity levels. The proposed ban would see an end to drinks which are bigger than 16 fluid ounces (the equivalent of 473 millilitres). The average can has 330ml while a pint has 568 ml, meaning that only sugary drinks roughly one third larger than a can would be allowed to be sold. The mayor told the New York Times that obesity is a major problem across the US and that “wringing your hands” is not a solution. More than half of all adults in New York City are either obese or overweight. The ban won’t apply to diet fizzy drinks, milkshakes, alcoholic drinks or low-calorie drinks, or to drinks sold in newsagents or supermarkets. If approved, the ban would be the first of its kind in the US, which is currently battling a rapidly increasing problem with obesity. The proposal will have to be approved by the members of NYC Board of Health who, as the New York Times notes, were all appointed by the mayor. Michael Bloomberg, who is serving his third term as mayor of NYC, has already brought in a range of public health rules, including banning smoking in restaurants and parks, making fast food restaurants display calorie counts on their menus, and banning certain kinds of fats from restaurants. What do you think? Would you like to see giant fizzy drinks banned in restaurants and cinemas in Ireland? Email “New York City set to ban large fizzy drinks”. Feedback on “New York City set to ban large fizzy drinks”.